These Gemba meetings take place first thing every morning. Team members gather in front of a whiteb oard used as a visual management tool. This board contains information about current production planning, machine running status, work prioritization, and individual assignments. Key decision makers including the president, quality, purchasing/production planning, manufacturing engineering, and sales managers use this time to connect with production personnel. This level of involvement from managers and executives is something that differentiates PMP from other deep draw stamping providers. The collaborative atmosphere of the Gemba meetings promotes an open dialogue focused on process optimization and how management can support employees by understanding their challenges. There are also meetings between engineering and deep draw tool makers to solve any issues reported by the operators. The Gemba approach provides a wide range of advantages in deep draw stamping applications and projects. Promote innovation changing what we currently do to what we should do based on the customer needs. 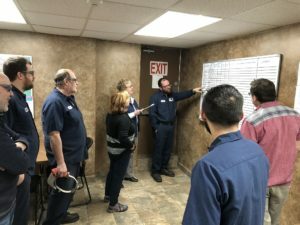 Ultimately, the Gemba meeting practice has a direct and positive impact on OTD, product quality, competitive pricing, and customer satisfaction. Plus, it is a strong indicator that PMP values employee input and engagement, and takes action to ensure that employees throughout the company have a voice in how we help customers meet their deep draw stamping goals. At PMP, we operate with customer satisfaction as the “true north” that guides all our daily activities. Contact us today to learn more, or schedule a meeting with our Sales and Applications Engineering Manager, Tony Romero. (<click on the link to schedule the meeting – you choose the date and time).